Over 3 years ago the third most popular social network in the world was created. Pinterest has become the ultimate hub for people to post theme-based images of recipes, fashion, crafts, and so much more. For local businesses in particular, Pinterest is the perfect place to connect with over 85 million unique visitors each month. Just recently, ‘Place Pins’ were added as a new addition to Pinterest. From a Local SEO perspective, Place Pins creates the perfect opportunity for industries such as food and hospitality to promote their local businesses to a massive audience. If you actually do have the best burgers in town or the cleanest hotel in the city, active Pinners can now view your business address, telephone number, and images of products or services you offer on a map. Before I provide you with a ‘Step by Step Guide to ‘Place Pins’ I am first going to teach you some basic SEO practices to get your Pinterest account pulling in customers. 1. Go to your settings, scroll down to ‘Search Privacy,’ and slide the bar to NO. You obviously want your business showing up in search engine results and if your bar is switched to YES, then all of your local business information will be hidden from Google and other search engines. 2. Go to your settings, scroll down to ‘Profile,’ and click ‘Edit Profile’. Fill out the ‘About You’ section with a description of your local business and specific targeted keywords you are going after. Also, in the ‘Edit Profile’ section, fill out the full address for your business and your business website. 3. Also in the settings section connect your Facebook, Twitter, and Google+ accounts. 4. Create local specific boards such as the city your business is in and showcase pictures of your city. Name the board the name of your city. 5. Create other boards that showcase high quality images of your products, services, office, employees, business history and business type. 6. Follow other Pinterest users in your area that have the buyer persona your business is trying to target. 7. Only Pin high quality images that you would like your followers to share and post a high quality display picture of your company logo. 8. Write detailed descriptions with long tail targeted keywords for your products, services, and local images. Also, add a link in your Pin description to your product or service on your website and the price of your product or service. Although the links are ‘no follow’ you can still easily obtain new customers or clients by showcasing your products and services. 9. Just like Twitter, Google+, and Instagram it’s also very important to use hashtags # when pinning to make your Pin easily discoverable. 10. Don’t just Pin pictures of your own business. Become an active user of Pinterest in your community and Pin as well as “Like” other people’s local pictures or images that relate to your business type. 11. Don’t just promote your pins on Pinterest. Make sure to share your Pins across all social media sites your business is active on. 12. Add a ‘Pin-It’ button to your website so traffic to your site can easily Pin images they are interested in to their boards. Ensure that the title and alt text of all of your images are filled out because this is where Pinterest pulls in all of the default information about your image. I am now going to walk you through how to set up place pins for your local business to optimize your local SEO. 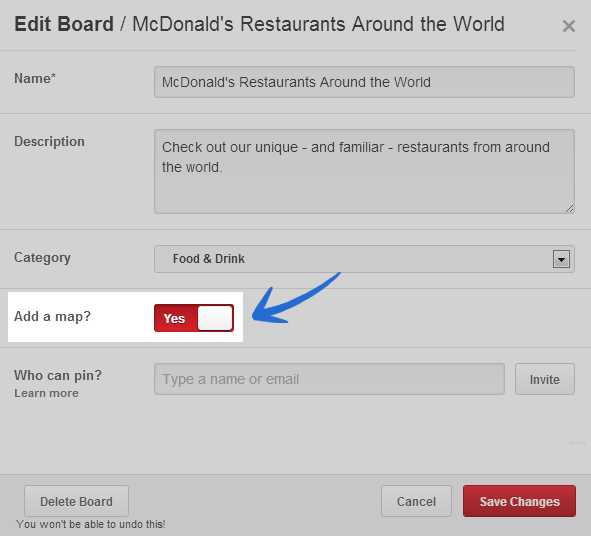 As an example, I have used the official Pinterest page of McDonald’s Corporation. McDonald’s has done a fantastic job at maintaining their corporate Pinterest page with over 3020 followers. They have created a board called ‘McDonald’s Restaurants Around the World’ which showcases unique McDonald’s locations from all over the world. This board serves as a perfect example of how McDonald’s can benefit from using ‘Place Pins’ to allow users to find their local locations. Once someone finds a location they are interested in, the pin will tell them the exact address and phone number of that McDonald’s location so that they can easily find it. Log in if you already have a Pinterest account or sign up with your Facebook account or email to set up a new account. Head on over to your board. If you haven’t already, create a location specific board. This board should include high quality pictures of your local business. For example, if you own a hotel or resort chain you would want to include quality pictures of each location. Once the ‘edit board’ screen shows up you will want to go to the ‘Add a map?’ switch and change it from ‘No’ to ‘Yes’. Once you have changed the switch from ‘No’ to ‘Yes’, select ‘Save Changes’. You will then be directed back to your board. 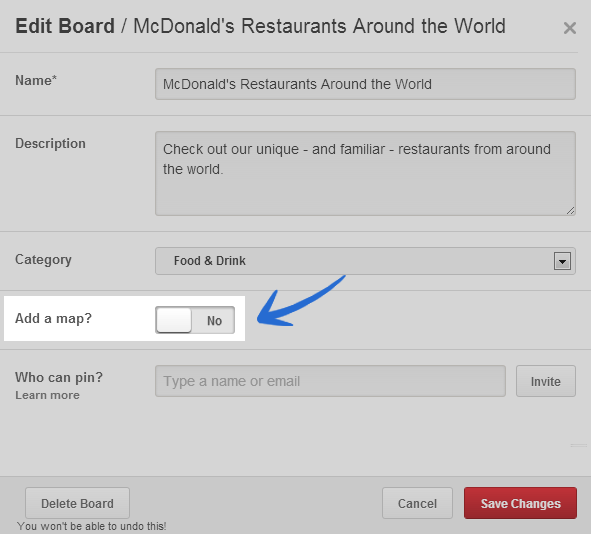 Select the ‘Cover Photo’ on your location specific board and you will then be re-directed to Pinterest’s new map. Once you are here you will have two choices: either add an existing pin to the map by clicking on the ‘(+)’ button next to one of your pins on your board or add a new pin to the map by clicking the ‘Add a Place’ button at the top. You will then have to enter in the address of the location you are searching for. Pinterest pulls in all of its local business information from Foursquare. As you can see they have showcased ‘Powered by Foursquare’ on the button of the ‘Add a Place’ screen. Note: If you haven’t claimed your local business(s) listing on Foursquare yet, you will have to go through the verification process, which can take upwards of 3-4 weeks to be approved. Make sure to fully fill out your Foursquare profile and add an image of your local business so that as much information about your local business pin show’s up on the Pinterest map. Once you have found the correct address for your local business pin click ‘Map It’. 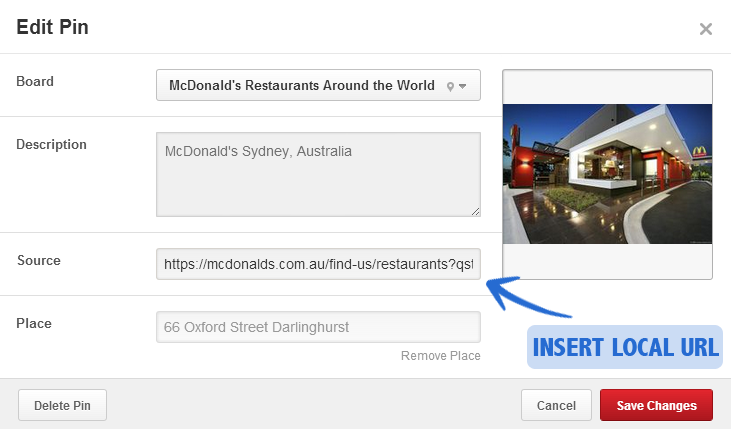 On Step 6, if you didn’t select an existing pin and instead clicked ‘Add a Place’, you will first have to ‘Map It’ then you will be re-directed to a page that makes you provide a description and either ‘Upload a Photo’ or select an existing photo of the local business. Once you have placed your pin on the map. Select the pin again to expand it like the picture below. When you view the expanded version of your pin, you will be able to see the map and address of your ‘Place Pin’. Click the ‘pencil’ to edit your pin. Inside the edit screen the default source page will be Foursquare. Change the Foursquare URL to your local business URL. For example if you have multiple resorts with multiple websites you will want to make the source the homepage for each resort. If you only have one website with multiple locations you will want to make the source the contact page for that specific local business location. Although this link is ‘no follow’ it will still have the potential to convert several people that might not know about your local business into new customers. If you know any other ways to boost your SEO or Local SEO with Pinterest or would like to share a successful ‘Place Pins’ campaign your company has started, tell us about it in the comment section below!